In 1990, at the age of five, Luo Gang was kidnapped and sold to a family in another part of China. Unable to remember his parents’ names or the village they lived in, he stood little chance of ever going home. But 23 years later he did. Luo Gang had waited a long time for this bowl of noodles. “No, no. It’s OK,” he replies. Luo had been a small boy the last time he had eaten his mother’s cooking. Now this simple meal marked a reunion that for so long had seemed impossible. “Don’t think about it, just eat,” his mother says as she dabs the tears that have begun to flow from her boy’s eyes. Luo’s father turns to address the crowd of well-wishers that have turned out for his son’s homecoming. The tender scene is the happy ending to a story that begins in 1990. Back then Luo was a schoolboy called Huang Jan, living in Yaojia Village, Sichuan Province. His father was a builder and his mother ran a shop. He had a younger brother. It was a modest but happy childhood – and he remembers well the day it changed. “I was going to kindergarten and there was a man and a woman,” Luo says. “I thought they were friends of my father so I went with them. The bewildered schoolboy had been taken to Sanming, 1,500 km (900 miles) away where life with a completely different family awaited him. Luo was given a new name and introduced to a new sister. He had become one of thousands of children abducted every year in China, very few of whom will ever return home. The country’s one-child policy and lax adoption laws has fuelled an underground market for trafficked children. 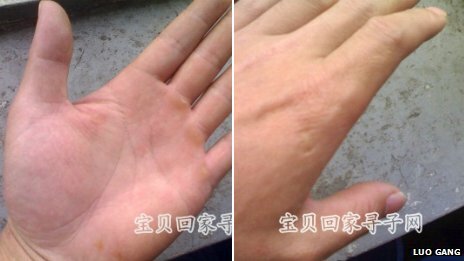 Earlier this year a police chief in Fujian claimed over 10,000 children had been trafficked in 2012 in his province alone. “I was very afraid, but I had been abducted and I had no choice,” says Luo, who at first assumed living with this new family would be temporary. But when he realised there would be no reunion with his parents, Luo made the decision to start rehearsing his fading memories, determined that one day he would use them to find his way home. So each night as he lay in bed, Luo repeated what he could remember of his life before. How he and his brother used to play on an old stone bridge opposite their little house with a tiled roof. How he had once fallen off the bridge and hurt his back. That there were two streams outside and how they used to cross rice fields to get to school. Luo’s new parents never explained why he had been taken before they died two years after his arrival. Nor did the “grandparents” who raised him after that. “I was angry about it but they treated me quite well,” Luo says of the couple he affectionately now calls grandpa and grandma. It is likely that his adoptive parents had paid traffickers to deliver them a boy – he thinks for as little as 5,000 RMB (£500) – though today Luo is keen to avoid blaming them for their actions. 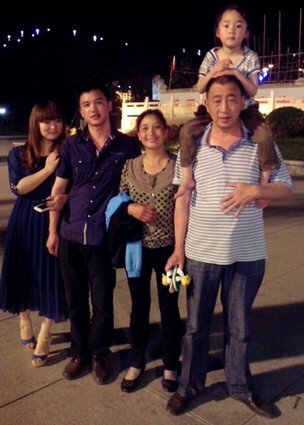 Back in Sichuan, Luo’s birth family had grown frantic. The local police made no progress with the case and his mother and father, Dai Jianfang and Huang Qingyong, took to handing out leaflets in neighbouring towns and placing newspaper adverts. But as the years passed and their savings dwindled, the distraught couple scaled back their search and adopted a girl. Luo, meanwhile, finished school and went on to complete national service with the fire brigade. Though he had settled in to his new life, his desire to be reunited with his birth family was growing stronger. “Fallen leaves will always find their way back to their roots,” he says, reciting a Chinese idiom. He registered with a government website that had been set up to reunite abducted children and their families. “I hit many dead ends but I kept on,” he says. In October 2012, when Luo was 27, he turned to a website called Baby Come Home, a volunteer-run forum where parents and abducted children share details of their cases. Luo posted details of everything he could remember – those memories that he had spent years rehearsing each night. He did not know the name of the village but he thought that he might be from somewhere in Sichuan – as a teenager, he recalled, a neighbour once remarked that he had addressed her with a piece of Sichuan dialect. Luo posted a photo of himself which had been taken by his adoptive parents not long after his abduction. He added a description of the red sweater with a white swan motif that he had been wearing on the day he was snatched (he presumed this had been knitted by his mother). “I ate braised pork at home, with a bit of couscous or sorghum on top,” he noted. “My house was built with tiles. Nothing special. The road was a tar road, newly built. Many trucks ran on it. It seemed like a main road. One of the bridges had been carried away by a flood, he thought. The site’s volunteers quickly began to consider the clues. “In 1990, people from east of Sichuan Basin didn’t grow couscous and sorghum,” a volunteer suggested. 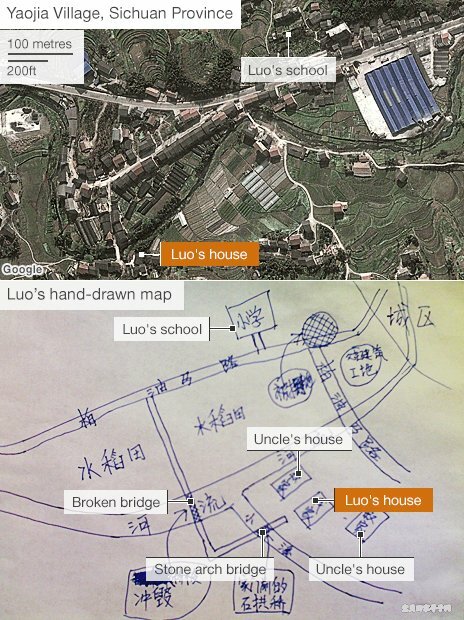 Next, Luo posted a map of his village that he drew from memory. The bridges. The walk to school through the rice fields. He thought that the newly built tar road could have been a motorway. Over the following months, Luo’s case was discussed on the forum and volunteers posted names of towns for him to consider. Even if he was correct in thinking he came from Sichuan province, that still left an area of nearly 500,000 sq km to consider – twice the size of the UK – and with a population of more than 80 million. But slowly the search was being narrowed. Records of heavy rainfall and areas affected by floods in the late 1980s were checked. Another volunteer looked up newspaper cuttings that had announced the construction of new roads. Then in March came Luo’s first breakthrough. A motorway map from 1990 had been obtained. If Luo had indeed lived by a motorway, the volunteer reasoned, the search could be narrowed dramatically – the map showed that at the time there were only two motorways in the area. Luo zoomed in on the satellite imagery and began working his way down the route of the motorway. On 26 April, Luo’s digital trek took him to Yaojia Village in Linshui County. It was here that he saw two bridges crossing a river with a distinctive turn. He found what could have been his old school. Opposite, where he remembered a building site, now stood a giant ceramics factory. Everything made sense. A volunteer from the website agreed to check out the area. “Yes,” came the reply. “The building is still a school!” One of the bridges had also been damaged by a flood in 1989 – just as Luo had remembered. This discovery coincided with another extraordinary piece of news. A volunteer had checked the area for details of abducted children and a couple who had lost a child at the same time as Luo went missing had come forward. 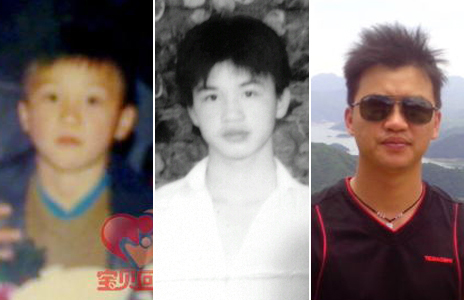 They said the boy had the nickname “Xiaodong” – Luo said he remembers being called by the name “Zhendong”. “I told my adopted sister and she said it was best that I go and have a look without telling grandpa and grandma,” Luo says. He was certain that he had found home and arranged to meet his parents as soon as possible. The whole village turned out to meet their lost son. Firecrackers announced his arrival and tables for a lavish meal were laid in the street. A volunteer from Baby Come Home filmed the proceedings. “The stove is still here!” Luo is heard to say as he enters his old home. His brother Huang Chao asks if he remembers the water tank – “there used to be a cupboard on it,” he prompts. “I often used a stool to climb up for the goodies stored up there!” replies Luo. The compelling footage found its way to a television station, and Luo’s adoptive grandparents – unaware of the reunion – were watching back home. Today Luo, who has returned to live with his biological parents, is circumspect about his abduction. The reunion allows Luo to honour a promise he made to himself that he would only marry his girlfriend when he had found his birth parents. With a wedding planned for next year, both families are invited.